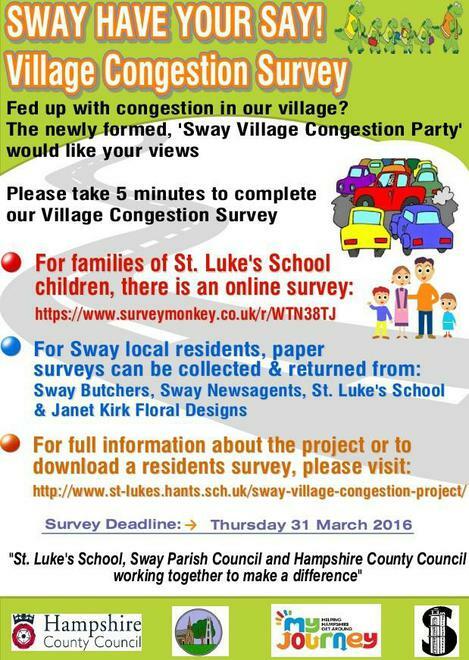 In the past, residents and parents have written to St Luke's School, Sway Parish Council and Hampshire County Council regarding Sway village traffic and congestion issues in the immediate vicinity of the school and in the centre of the village. In December 2015, Rachel Goplen, (Headteacher at St Luke's School), Councillor Ken Thornber (Hampshire County Councillor), Councillor Barry Rickman (Chair of Sway Parish Council), Mike Fleming (School Local Authority Governor and Travel Champion) and Ellie Bolton (Hampshire County Council Travel Adviser) met to discuss these concerns further with a view to planning what we can do together to improve things. A joint 'Village Congestion Working Party' was formed and in addition to the above included Helen Lennox from Gracewell, Jane Brennan, a resident in Wesbeams Road, and Stuart Redhead (PCSO). We want to work together with residents, parents and others affected by traffic congestion in the village to attempt to make things better. In response to surveys completed by residents and parents in March 2016, Sway Village Congestion Working Party met on 22nd April and 10th June and to review next steps. The Working Party discussed options below. Exploring whether the Cango Bus can be used to transport children to and from the school from the Jubilee Field. Asking HCC to complete a traffic survey to explore the potential options for a footpath from the Jubilee Field to Church Lane, benefits of resident parking only in Westbeams Road and a One Way system along Church Lane. Carrying out the above as part of a comprehensive strategy to look at traffic management in the wider area of the school. Please note, points 2 and 3 will involve full consultation with residents if and before any changes are made. At present the school is awaiting 2 and 3 to be completed. Use of the Cango Bus has been explored but is not a workable option moving forward. Please find below the results of both resident congestion surveys and surveys completed by parents of children at the school. in March 2016. The letter below was our first letter to Sway residents and families at the school, asking for views about village traffic congestion and ideas for making things better. If you were a resident in Sway village and affected by traffic congestion, we asked you to complete the paper survey below. Residential surveys below were available to download and return to school by hand or email to adminoffice@st-lukes.hants.sch.uk Alternatively, hard copies of surveys were available for collection and return at Sway Butchers, Sway Newsagents and Janet Kirk Floral Designs. The deadline for completion and return of all surveys was Thursday 31st March 2016.